A third topic that fits in that realm — costumes. I know some adults find occasions (Cons, Renaissance Faire, roller derbies) to create and wear costumes. My response is equal parts envy (how cool!) and mystification (how can it possibly worth that much effort?). My first Halloween costume. 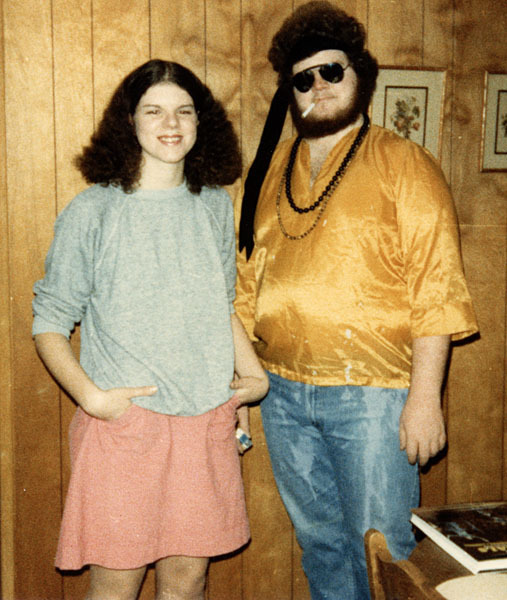 In fact, I was a hobo for Halloween and so was my brother for several years running. Mother liked how easy it was for her — one of Dad’s old shirts and one of her old hats, a touch of make up to simulate dirt and call it done. When we were a bit older, Dale and I routinely won in the “group costume” category of the annual Lions Club Halloween Parade in Louisiana, Missouri. Of course, there were very few participants in the “group costume” category and that helped our chances considerably. 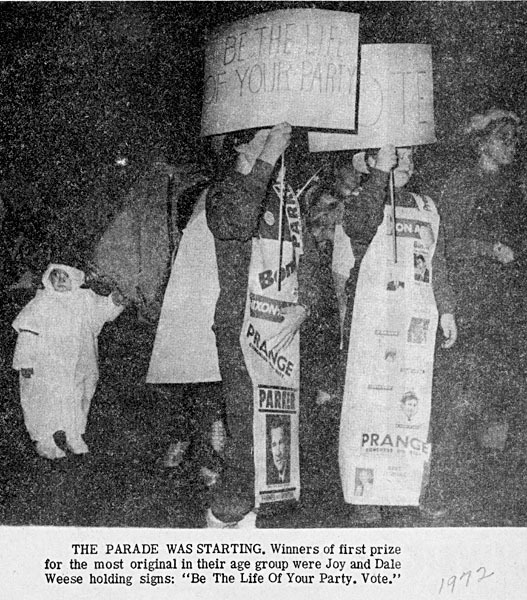 Our costumes always consisted of homemade sandwich boards made from decorated poster sheets. I remember one year we were Ding Dongs (those Hostess chocolate-covered cupcakes) one of us was “Ding” and the other was “Dong.” For me, the best part of the Halloween Parade was powdered-sugar donuts and apple cider on the Riverfront at the end. The election year of 1972 was the one when my parents were most energized by politics. Watergate and more local disappointments dissipated that energy. Our Halloween costumes reflected their interests and got our pictures in the local newspaper. When we got older, we had the rare occasion to make up our own costumes, but we seemed to have inherited my mother’s lack of patience and creativity in this area. Dale did better than me on this occasion. 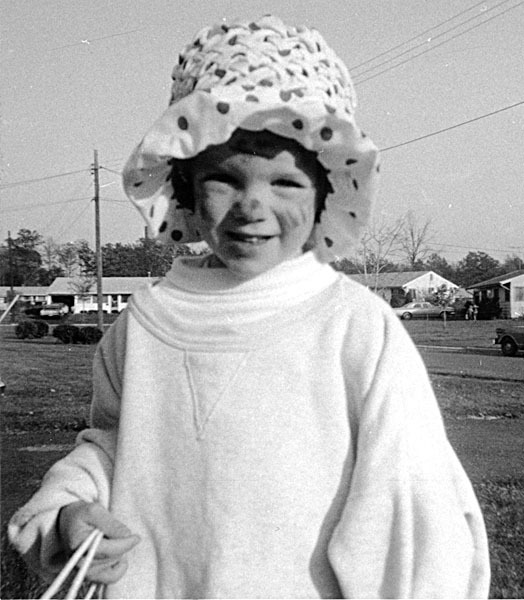 How often did you wear costumes as a child? How about now? Will you be dressing up for Halloween this year? This piece brings up so many great memories for me. It is funny to think back and remember what a big deal it was to wonder about costumes—and what to pick-and I loved the parades as we in school! Thank you for this posting. Although I didn’t write about costumes, I did include a reference to Halloween and trick-or-treating with some friends. That post will show up later today, probably while Rob and I are out shopping for Halloween costumes. We used to dress up all of the time but Rob usually works and we haven’t had reason to buy any. Because I haven’t lost the weight I’ve gained, we have to go out and buy something that fits me and Rob is along for the ride, as it were. As a kid, all I wanted were store bought costumes. One year I got a hard plastic princess mask. I loved it. “Group costume” is a bit mystifying, but I admire the participatory zeal you guys had! Love your photos. Oh how I loved Hallowe’en. Thanks for the great post, and for stirring my own memories! I love the photos that accompany your memory, and I confess, I envy your willingness to toss on a shirt and hat and call it good. I’m from a family of costume overachievers. I enjoyed it a lot as a kid and even as a young adult. These days, I feel like, “Why bother?” although we get invited to costume Halloween and New Years parties. Nowadays, if it requires a costume, I don’t go.